One of the strangest mystery spots in Central Illinois is undoubtedly Williamsburg Hill. It is located in the south central part of the region, near the small communities of Tower Hill and Shelbyville. The hill is not hard to find, for it rises to its highest point at 810 feet, making it the highest elevation in that part of the state. The village of Williamsburg, which was also called Cold Spring for a time, was laid out in 1839 by Dr. Thomas Williams and William Horsman. It was located on the south side of the large hill and for about 40 years, was a bustling community of about four square blocks. At one time, there were two churches, a doctor's office, a saloon, a post office, a blacksmith shop and a number of modest homes. The Main Street of the community was once part of the "Old Anglin' Road", a stage route that ran from Shelbyville to Vandalia. It was this stage line that brought prosperity to the village for many years but when the stagecoach died out, Williamsburg followed suit. The end came in 1880 when the Beardstown, Shawneetown and Southeastern Railroad constructed their line to the east of the village. The residents of the village moved along with it and most settled three miles to the east in the now burgeoning community of Lakewood. A handful of people remained, but the village had now become a ghost town. Many of the buildings were simply abandoned, although the original Methodist Church was dismantled and moved to Lakewood around 1900. Other buildings remained, slowly rotting away, until most of them were either torn, or fell, down. The original stagecoach station, which was a huge, wooden building, stood just east of the main trail for several additional years. It was finally destroyed in the 1960's. Today, there is nothing left of the village, save for a few old gravel pits. The land where it once stood has long been plowed under and trees have covered the area where homes once stood. One of the strangest locations on the hill is a place called Ridge Cemetery. 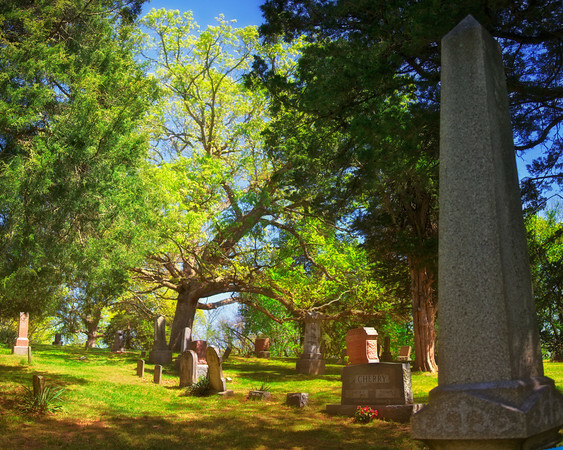 This rugged graveyard can be found on the highest summit of Williamsburg Hill. The desolate burial ground has many tilted stones, thanks to the sharp hills, and also bears evidence of both vandalism and unmarked graves. The cemetery can be found by watching for a massive microwave tower, located just east of the burial ground. Ridge Cemetery has been part of the lore that makes up Williamsburg Hill for many years and has long been considered a frightening place. It is located back off the main road and down a wooded lane that is very dark for those curiosity-seekers who venture down it at night, braving the sheriff's deputies who regularly patrol the road and graveyard. Cases of vandalism, and some say darker things, have forced the authorities to close the place after dark. There have been reports of cultists using the cemetery and this has sparked both gossip and concern in small, surrounding towns. As far as I know, there is little evidence to suggest these stories are true, but once such rumors get started, they are hard to stop. Other stories of the burial ground are more ghostly in nature. Many of these tales speak of strange lights and apparitions in the vicinity of the graveyard and the woods beyond it. In the forest, there are a number of forgotten graves that have been hidden by time. There are also anecdotes concerning the old road that leads back to the cemetery, namely stories of a bobbing red light and a spectral old man who vanishes if anyone tries to approach him. In addition to the many stories told by visitors to Williamsburg Hill, there are also the incidents that occur involving those who still live here. Many of them will state that strange things happen here on a daily basis, as if the landmark that rises from nowhere out of the prairie acts as some sort of signal beacon, or magnet, for strange activity. "I have lived in this area all my life," one of them told me recently. "I have encountered a number of strange occurrences on Williamsburg Hill... some at the cemetery, some in my own yard and a few times along the road. The first time was at the cemetery, when I was about 11 and I was there with my father. He was a number of yards away from me and we were alone. I heard someone sob and turned toward the noise. It was a clear, sunny day, in the middle of the afternoon, but the scene before me was an overcast, misty day. Several people were dressed in dark colors and standing in a loose cluster. I also heard horses. Then, my father called to me. I looked away and when I looked back, it was gone." Many of the incidents that she spoke of were obviously unsettling to her, but none more so than those involving her daughter. Years later, after getting married, she moved back to Williamsburg Hill to raise her family. One day, her three year-old daughter decided to go for a walk on her own. They later found her, most of the way down the old road to the cemetery. "About a week later," she continued, "we were in the car and driving past the cemetery lane when she said 'the people who live down there want me to come and stay with them'. This made me jump! I asked her who lived down there and she said 'the people in the ground'. She was only three at the time and I never told her what a cemetery was for, let alone that people are buried beneath the ground. That's why it rattled me so badly." "You also mentioned some other weird things that have happened? ", I questioned her. Claire nodded. "A friend of mine's father was one of quite a few people who found a mutilated cow not far from here. She'd been bled and the unborn calf taken, along with her reproductive organs. There were symbols scratching into the earth, made with rocks and such and absolutely no blood spilled around the cow to mark her butchering. I'm not sure if there was anything in the papers or not but those sorts of stories are always popping up around here." So what makes Williamsburg Hill so strange and haunted and why has it been the source for so many legends over the years? It's possible that the huge microwave tower on the hill could offer some clues, even if some of the stories were already being told before the tower was ever built. Could some of the phenomena be attributed to the tower? Is it possible that the strange lights, glowing balls of energy and eerie apparitions are some sort of side effect from the magnetic field around this structure? It has also been suggested that the tower may be attracting the paranormal phenomena, instead of creating it. Perhaps lost spirits are feeding off the energy given off by the tower, resulting in the myriad of stories that plague the place? Or maybe, as was suggested earlier, the strangeness was already here, attracted by the natural landscape of the hill? Who knows? Regardless, if any of the numerous stories about Williamsburg Hill have even a semblance of truth to them, then the place is infested with ghosts! And would not be the sort of place where anyone in his right mind would want to venture after the sun goes down! Williamsburg Hill is located in a remote rural area near Tower Hill, Illinois. The hill can be seen for some distance because of it's peculiar location on the otherwise flat farmland. The cemetery is heavily patrolled by law enforcement officials and is closed after dark.